You are invited to hear our friend Kate Merrick share about how we can unearth peace and presence in our over-connected world. 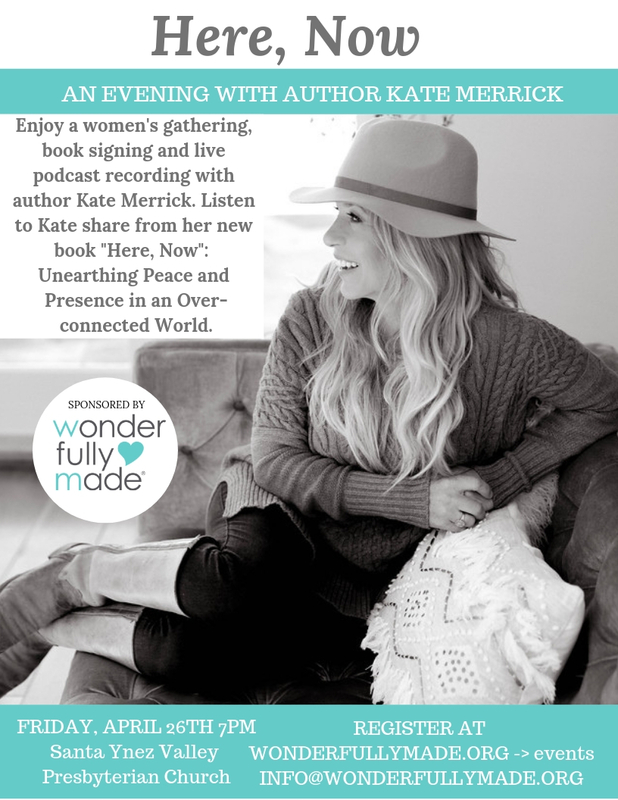 Enjoy an evening of friendship and community with other women as we listen to Kate share an excerpt from her new book, “Here, Now” and then interview her for a live recording of the Wonderfully Made podcast. The evening includes a personalized signed copy of “Here, Now” as well as dessert, coffee and tea. Kate Merrick is the cofounder of the Reality family of churches along with her husband, Britt. She speaks, writes, and lives with her family, five chickens, two goats and two miniature donkeys in Carpinteria, California. Kate Merrick takes readers on a journey to drop the distractions and check back into their actual lives, discovering the good, true, and beautiful things God offers when they choose to be present right here, right now. In Here, Now, Kate Merrick invites women to stop running away from their actual lives and instead to walk in the peace and fullness God offers when they quiet their souls, listen to what he’s saying, and live with brave intentionality. With more than a little personal confession, humor, and honest contemplation, Kate brings readers into her journey to look deep inside her heart, identify and remove the obstacles that prevent her from being truly present, and intentionally receive the gifts of God found in all of life’s moments–the painful ones, the big and beautiful ones, and also the ordinary ones.